Founded in March 2002, the BEP Speakers Bureau educates and inspires students in our community about career choices and education paths in order to enhance their career development. Through the Speakers Bureau, teachers invite speakers from the business community into the classroom where they provide practical information for students to make informed career decisions. Looking for speaker ideas? Click here! I have used the Speakers Beaurea for 5 years in all my classes. There is a wide variety of speakers to choose from and my students always ask when the next one is coming in. It is very organized and easy to book a speaker that relates to your subject area. It gives the students a real life example of some one working in the course subject area. Thank you and I look forward to booking a speaker again soon. Guess my Career Day at Forest Heights was fantastic! 60 Students were engaged, curious, respectful, and got a chance to participate in an interactive round table setting that was fast paced, professional, and extremely well run. Julie Dreisinger put together an interesting and diverse group of local entrepreneurs and business owners from a variety of industries to share their valuable experiences via an energized, timed, competitive atmosphere. The format was exciting and encouraged students to take the lead when investigating potential careers. 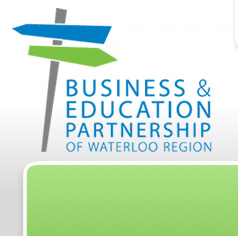 I strongly recommend all Business Studies teachers in the WRDSB take full advantage of this session. The Business and Education Partnership helped co-ordinate a ‘Guess My Career’ event for our co-op students. The event was very well organized and the speakers were excellent. The students clearly enjoyed the event and gained great insight into six rewarding careers available within the local community. Along with discussing their work, the speakers sent a clear message of the importance of hard work, and learning from a variety of experiences. Our students were engaged and interacted nicely with the guests. I highly recommend ‘Guess My Career’. We plan to run the event again in the future. The career carousel event is an annual event at Woodland Park for our intermediate students. The expertise and knowledge of the guest speakers enable our students to look beyond the walls of the classroom and see the possiblities that exist out there in the real world. The students get a first hand glimpse into where their education could take them. The Business and Education Partnership makes this connection possible. ARE YOU A TEACHER WANTING TO BRING INDUSTRY PROFESSIONALS INTO YOUR CLASSROOM? Register and submit your request! Our staff will follow up with you soon! ARE YOU A COMMUNITY MEMBER INTERESTED IN SHARING YOUR CAREER JOURNEY? Register for our Speakers Bureau and our staff will follow up with you soon! Industry professionals volunteer their time to speak to youth for a number of reasons including inspiring youth to explore new career paths, showcasing and promoting their field/industry/company to the future talent, helping youth reach their full potential, giving back to Waterloo Region, and developing their own presentation skills.